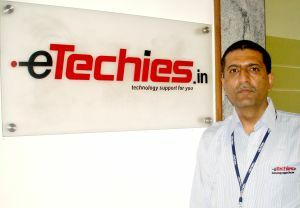 Gurgaon-based managed services startup eTechies has bagged 2,500 clients in the past six months â€“ inclusive of consumers and SMBs. After raising a seed round from super angel Rajan Anandan, who is now MD of Google India, eTechies now has Jaspreet Bindra, the head of Microsoft's Entertainment & Devices Division in India, on its board. Etechies has appointed Viedea Capital Advisors to help raise its first institutional round. Rohit Chaudhary, Co-Founder and CEO of eTechies gives Techcircle.in the low down on how the company has been scaling up, clientele, ROI, expansion plans and more. How have the past six months been for eTechies? Can you talk about your growth vis a vis November 2010 when you raised your seed round of funding? It has been an exciting phase of learning and execution for us and I am glad to say that all our fundamental assumptions have been positively vetted. The business concept of providing IT/technical/technological repairs and services to home users and small businesses has been accepted by stakeholders. In November, we had a handfull of clients and today we service 3,000 unique nodes, which include PCs, customer premise equipment, routers, laptops etc. We are adding over 500 unique nodes every month. What is the mix of consumers versus SMBs in your clientele list? Of the total customers, I would say close to 40 per cent is small business sign-ups. However, node population wise, small businesses share would be close to about 70 per cent of the total nodes under our service. We have around 1,500 home users and small business clients and attend to more than 100 daily onsite and online customer issues. Till date, we have handled and resolved 7,000 customer issues/complaints. What is the ROI of your services for your SMB clients, typically? I can talk about cost reductions - on an average we help our clients reduce their technology operating costs by anything between 25-30 per cent. This is a net addition to their bottom line. Typically, a small business is able to recover the investment into Etechies.in service in less than six months. Can you share a case study of a client and its savings with our readers? One case is of a small CA firm, which was expanding and required a multi-nodal services provider. Earlier, when the printer would not work they would call a printer repair technician, who would then lay the blame on the cartridge refilling guy; the cartridge refill guy would in turn blame the networking; the network guy would point out cabling and finally the cabling guy would bring up issues related to technology hygiene and lack of repair and maintenance of the hardware and software. So there was utter chaos and no one was held accountable towards the upkeep and maintenance of IT infrastructure and meanwhile, productivity was falling. We stepped in and suggested thin clients and hosted/ cloud computing solutions at a small incremental cost which has helped the company reduce its IT spending into hardware and software by almost 40 per cent. Which sectors are you actively targeting? We are sector agnostic and cater to all small businesses, irrespective of their business domain. Jaspreet Bindra and Rajan Anandan are on your board - how have they helped eTechies so far? Bindra recently joined our board of directors and plays a major role in terms of shaping-up our consumer and retail strategy. Rajan Anandan has guided our strategy. Ultimately, he shares wisdom and helps us set up meetings, presentations, in business tie-ups and the real brass tacks. The standard advice that we seek and we get from the board is to unrelentingly validate our business assumptions and move at a lightening pace, as and when changes are introduced. In November, you said the plan was to expand to 20 cities â€“ what is the status? We have established ourselves in Delhi/NCR region, which is almost six cities in itself - Gurgaon, Delhi-5 zones, Noida, Greater Noida, Ghaziabad and Faridabad. It gave us the opportunity to test our systems, processes and controls, and develop a scalable executable model for the rest of India. Now we plan to expand our footprint nationally, starting with the metros. We hope to be in two metropolitans in this fiscal and will be ramping up operations in other cities as soon as feasibility studies are completed. What are the key areas of focus for the year? Training of resources, robust communication tools, building upon our existing proprietary platform and hiring of key resources - these will be critical to help us scale and sustain our business model this fiscal. Our aim is to be in at least six of the top ten cities by business opportunity. We currently run four tech hubs in Delhi/NCR region and employ 100 technical support personnel. By the fiscal end, we clearly are hoping to have in excess of 1,000 people. On the retail front, we are setting up neighbourhood service stores that will act as a 'walk-in' access as well as technical/repair hot spots. I cannot share more details on our plans or locations as of now. We also run a centralized contact centre, based out of Gurgaon. Can you list your partnerships? Are you planning to bundle your services? We are in discussions with large telecom players, retail chains and OEM manufacturers but will not be able to share details. We will be announcing the deals as they get finalised. Yes, there are on-going business talks of the kinds that will bundle-in our services to relevant business segments and products but it will be premature right now to say any more.